In the spring of 2012, my colleagues and I brought a group of students to Trsice in the Czech Republic. 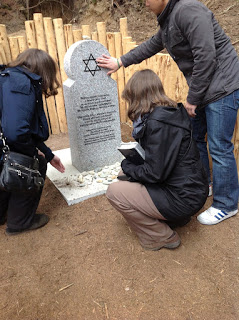 Our students, together with the local community, dedicated a memorial to a young Jewish boy named Otto Wolf, his family, and the townspeople who saved them. Otto’s story is included in Salvaged Pages: Young Writers’ Diaries of the Holocaust that we as Holocaust educators had used in our classrooms for years. Alexandra Zapruder, the book’s editor, joined us for this commemoration, which our students had raised money and worked for years to make happen. They wanted to mark the place in the forest where Otto, his parents, and his older sister Lici hid for so many days and nights from 1942-1945 with the aid of Christian residents in the Trsice area. While in hiding, Otto wrote in his diary every single day for more than three years. The conditions in which they lived are unimaginable, but Otto vividly described in great detail their daily existence for us in his journal. He also described the people, some who helped and some who didn’t. Sadly, his sister Lici needed to take over writing the diary; Otto and other young males from the village were captured and killed in April of 1945. We needed to memorialize this place so that students in the future would read Otto’s diary and understand that when people work together, it is possible to change history. Because our students cared, they have now turned this place into a historical site in the forest where other school groups go on field trips and learn about Otto Wolf and the people who risked their lives to save them. Because one family refused to follow deportation orders and took a risk, they survived. Because the non-Jews of Trisce chose to help, the rescued an entire family. During the commemoration, Otto’s words rang out in the forest once again as a young Czech Boy Scout read from his diary, giving life to the young man who immortalized the truth about the Holocaust and the notion that just because it happened doesn’t mean it was inevitable. Otto’s story is only one of many in the collection of Salvaged Pages that make a difference in the lives of our students and many others who read the diaries. These diaries and the people who wrote them are part of our souls as educators who study them and teach them to our students. By reading their work and telling their stories we show that the history of the Holocaust is not just something of the past, but is a pulsing part of our world today. I think about the importance of our work as teachers of the Holocaust. I encourage all teachers to realize what a difference they can make by engaging our students in the texts we teach, drawing them into the work, and bringing the relevance of the text to life on our world today. Facing History has created lessons plans, resources, and teaching strategies for teaching Salvaged Pages in your classroom. Learn more about how you can use the diaries of young people during the Holocaust to deepen your students’ understanding of this history in a whole new way. You can learn more about the Holocaust Study Tour, by reading their blog. *Photo Caption: Lisa Bauman kneels in front of a memorial for Otto Wolf with students and colleagues during the 2012 trip to Trisce in the Czech Republic.